so how many monkeys would consider this a mountain bike? Discussion in 'The Lounge' started by rogue22, Jan 3, 2008.
unfortunately this is what mountain biking (apparently) is coming to here in blohio. who can spend the most money, have the lightest bike, and have it look best in their living room. i could break it in 10 minutes. No, it's not a mtb. A mtb has a chain. Yeah, but you'd be pulling carbon splinters out of you for weeks. Well... once they put the missing parts back on, I'd consider it a mountain bike if it sees dirt and doesn't collapse on itself. It is not what you ride but where and how you ride it. I have been ultimately shamed multiple times by superior riders on cyclocross and XC bikes with super long stems disturbingly narrow tires. Sounds like an excuse to nail fat chicks doesn't it. oh thats not the issue, I used to ride a long stemmed skinny tire xc bike but no fat chicks. Does it change anything to mention this rider is among the old gaurd in the local mtb organization that refuses to build any challenging trails or acknowledge any other forms of mtb other than xc race? guess theres no mountains in ohio? and that seatpost is scary high. I would pay good money for video footage of the owner trying to do runs down snowshoe. Oh sorry, I forgot you wear a vest made of kittens. 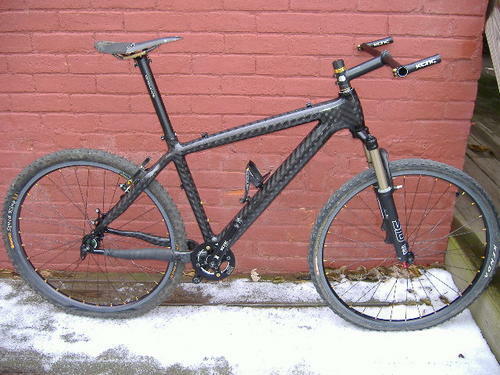 Why would you have a carbon frame and put bar ends on it? Heck...they could save more weight by putting a Thompson post on and a lighter stem with a carbon bar and getting rid of the bash guard. does it have a chainguide? So do you consider that worse than the guy that bought a Foes Fly from my LBS, then had it painted to match his Escalade? He had a lot of money and had never ridden before, but the build was sick and cost a little over $6k. Looked great mounted on the new roof rack, too. It's a bike, but looks a little front heavy! I could never ride that thing on our technical New England trails. Then again, I use a 30+ pound long travel bike to make up for my lack of skill. That's all you needed to say, right there. Seriously, there are several nice carbon frames on the market, for XC use. Here in Arizona they would last all of ten minutes on the rock, the first trip on Desert Classic, Haws, or McDowell comp loops would do some serious damage. You act like there's something wrong with the owner of that bike only being interested in XC race-style riding... How is that somehow not the same level of lameness as all the kids that swing from Sam Hill's nuts and don't even own a bike that can be pedaled on flat ground? Except for the Tune saddle all of the stuff on that bike is perfectly fine for xc racing, even on gasp technical trails. I wish I had a nickel for every hater thread. "Everyone who doesn't ride exactly like me is gay!" If you want more challenging trails, get involved, and start building them. If that frame is what I think it is - it was part of a mountain biker group buy and was only about 600 bucks or so. With a chain it definitely looks like a mountain bike to me - and one that someone could pedal very fast at that. Its a Mail Order frame..... I have seen this frame before. It is made over seas from a company that makes a lot of Carbon parts. The funny thing is this company makes some parts you see with other vendors names on it here in the US. Why the bash ring and no Big Ring? Note no small ring either. I'm guessing it is a single speed. That looks to me like the other crank arm - so it looks to me like this will be a single speed using a bashguard to protect the chain in front or a 1x8 or 1x9 type set up. Not all that strange these days at all. I don't know the OP or anything about him but this post really annoys me. Stop hating and celebrate the fact that cyclists reflect the diversity of society as a whole. How boring would it be if we all agreed on what and where to ride? How about looking at how much you have in common, as opposed to how much you are different? Not only that, but how about giving the guy props for being part of the "old guard" in an mtb organization? He is probably part of the reason you have ANYTHING to ride legally. If you don't agree with his approach, why not get involved and engage in an intelligent debate? Attend some meetings, draft some proposals, talk to local officials, etc. You know, actually do some work and put in some effort. Haha, that is kind of how I felt when riding with you! I'd rock that bike, as long as I could fit on it properly. Looks light and it probably flies up and down trails. Needs gears and a chain though. Would you call this a mountain bike? See the problem with categorization? No. That is an overgrown BMX bike where someone is using suspension to compensate for skill. Obviously you have not ridden with ito. The most skilled rider I have ever met continues to ride a 1989 Bridgestone full rigid. 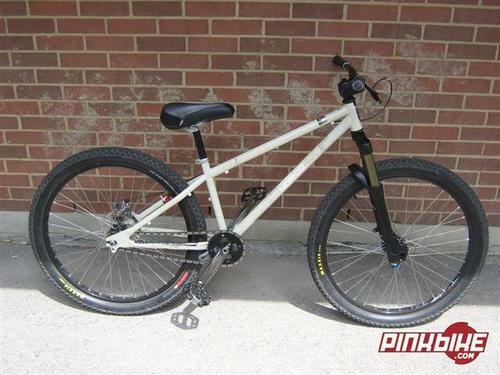 He is in his mid 50s and has no interest getting a a more "modern" mountain bike. He doesn't soak up rock gardens with plushness & speed. He masters them with experience, skill and 1.2" tires. I'd ride that bike round here where the trails are pretty tame. Why not. I have a 5 - 6 inch travel bike for other riding. You were the freak riding the rigid singlespeed. I was rocking every possible modern conveinience available for a bike, short of disks. Vee brakes rule.